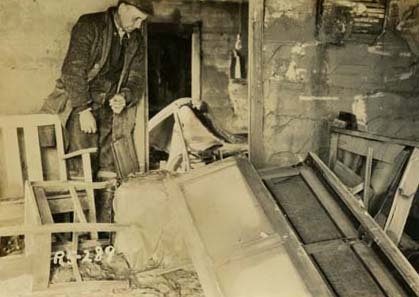 Gilbert Sheerer, Works Progress Administration foreman, looks through his home in Mound City after the flood. On verso: "This was general condition of each room in his home, the house was left in center of street from flood waters." The Abraham Lincoln Presidential Library and Museum holds all rights and permissions. “Gilbert Sheerer,” Chronicling Illinois, accessed April 24, 2019, http://chroniclingillinois.org/items/show/27870.